The main reason I end up at Matsumoto due this is the best place to start my journey to Kamikochi and Alpine Routes trip. After spending half afternoon exploring Matsumoto, the next morning I woke up at 5am to take the first train out to Kamikochi. Paid 4,550 yen for round trip and please make sure to book your return boarding number once you reach Kamikochi bus terminal or you end up overnight in the jungle. WTH! For your note the JR Pass is not valid on these trains and buses. 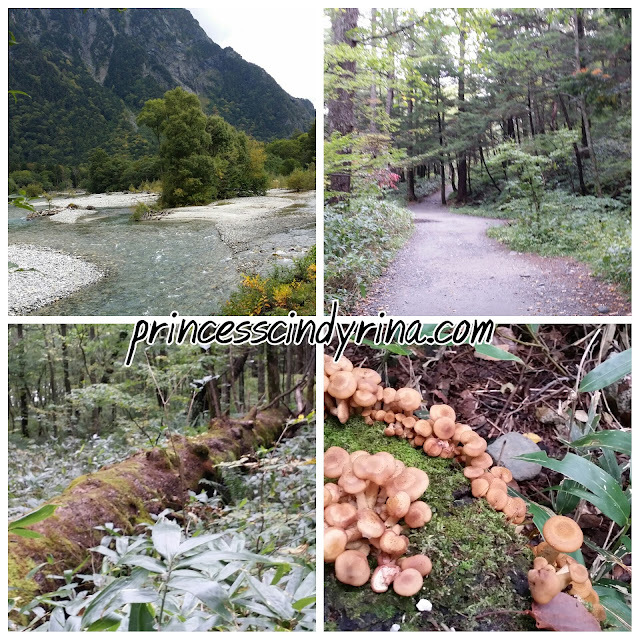 Kamikochi is a unique place of scenic beauty and important natural treasures which boast a spectacular Chubu Sangaku National Park. 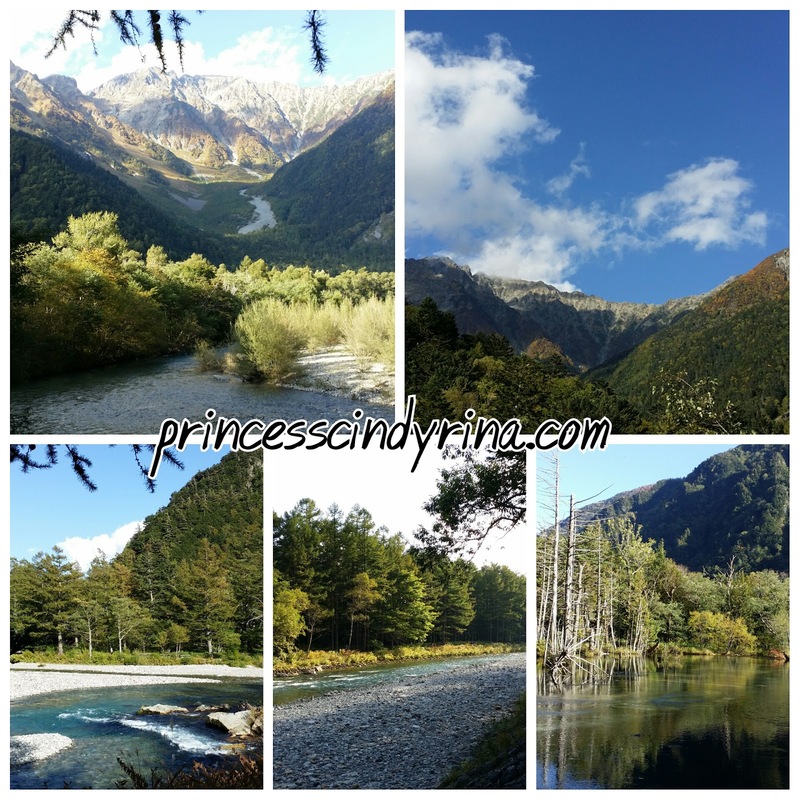 I was a great pleasure for me to be able to walk through the Kamikochi area which is a roughly 15 kilometer long plateau in the Azusa River Valley,about 1500 meters above sea level. Everywhere in Japan, the first thing I did when I reached certain places is to go to Visitor or information center to get map area. 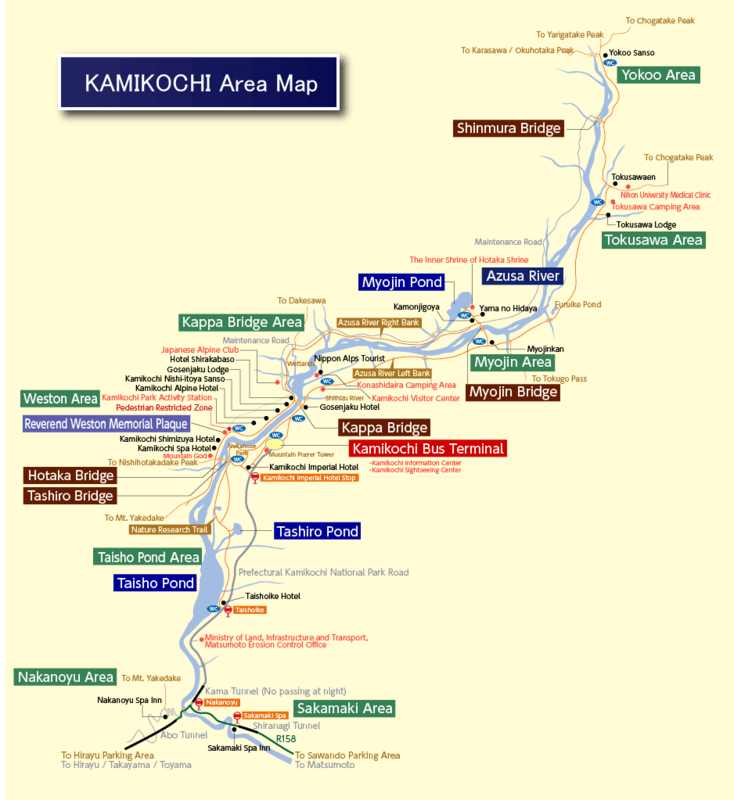 Here at Kamikochi you need to purchase the map. If I not mistaken I paid 100 yen for one pocket map. Then vending machine for some hot drinks. Yup! I was that vending machine addicted in Japan. ngehehehehe...MUST BUY! MUST BUY! Sightseeing at Kamikochi really interesting. I wish I could camp out here. WTH! If I have chance to come here again , I would love to overnight in a tent out here. 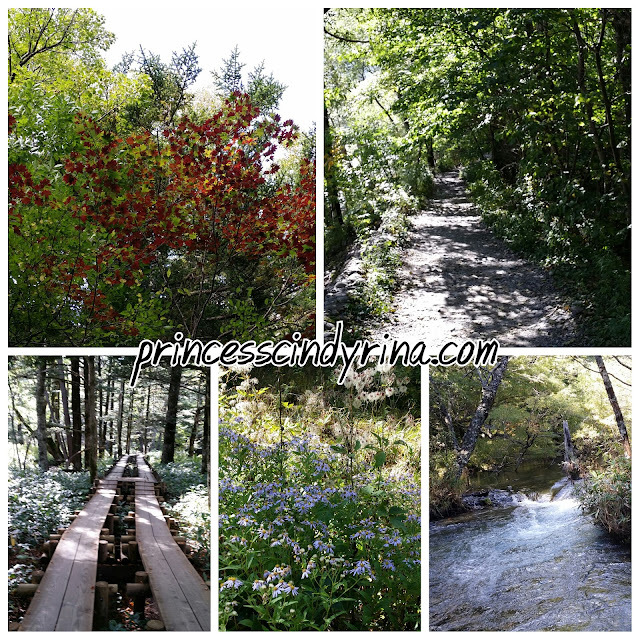 I end up goign through the hiking trails along Azusa River from Taisho Pond to Myonjin Bridge. It is a mostly flat terrain and requires no hiking experience at all. 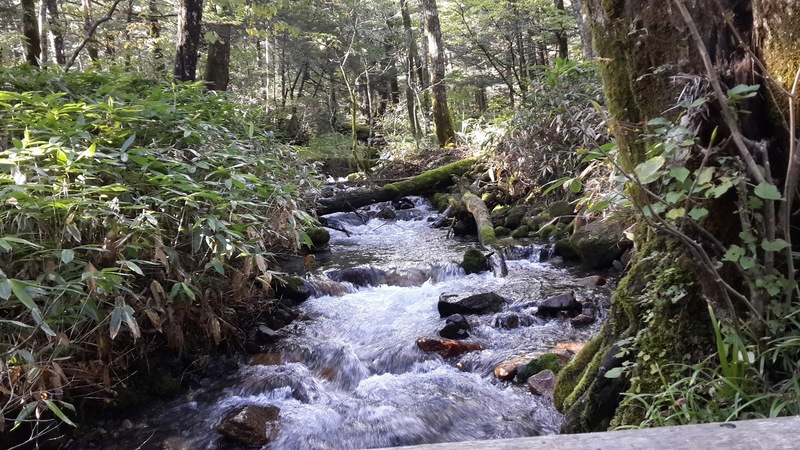 Taisho Pond (Taishoike) was formed in 1915, when an eruption of the nearby volcano Yakedake dammed Azusa River. Decayed trees, standing in the pond, provide a special sight. 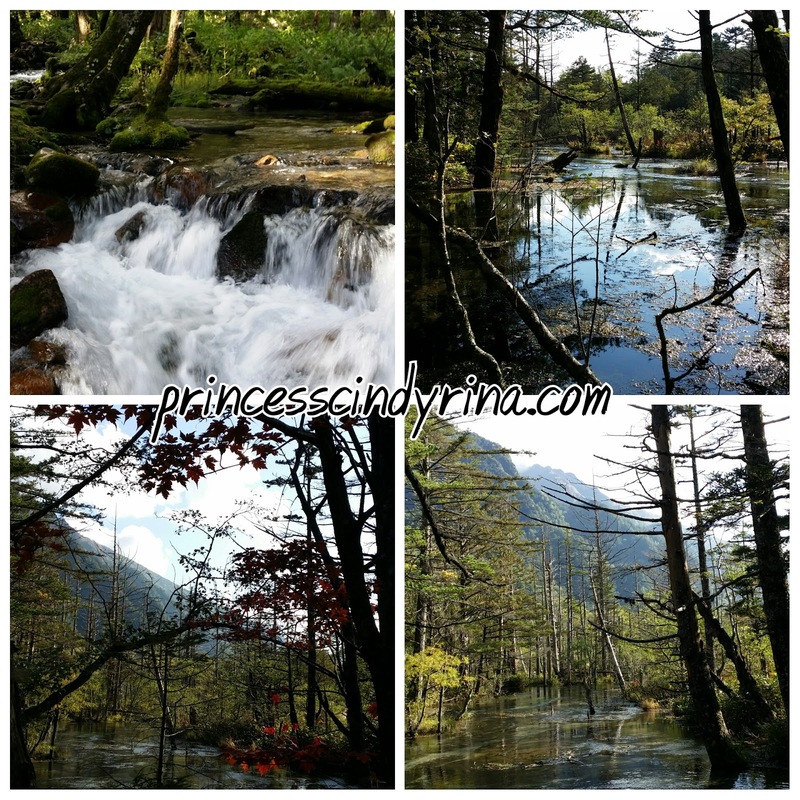 Tashiro Pond, one of Kamikochi's most scenic spots, is a small pond surrounded by marshland. 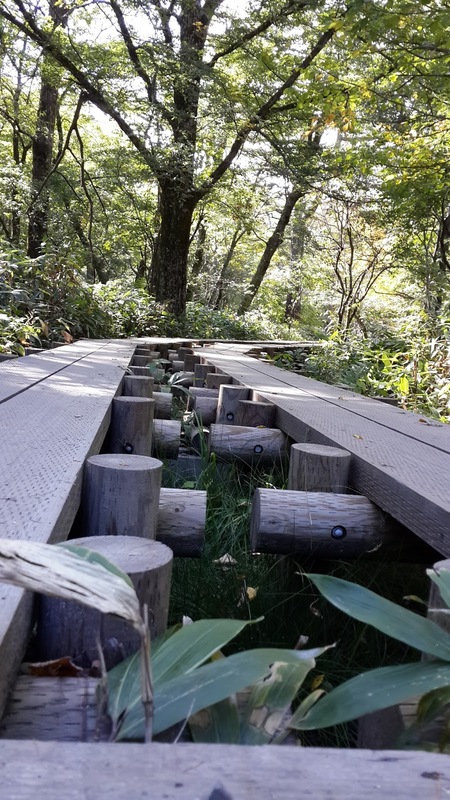 It is located along the hiking trail that connects the Kappabashi with Taisho Pond. 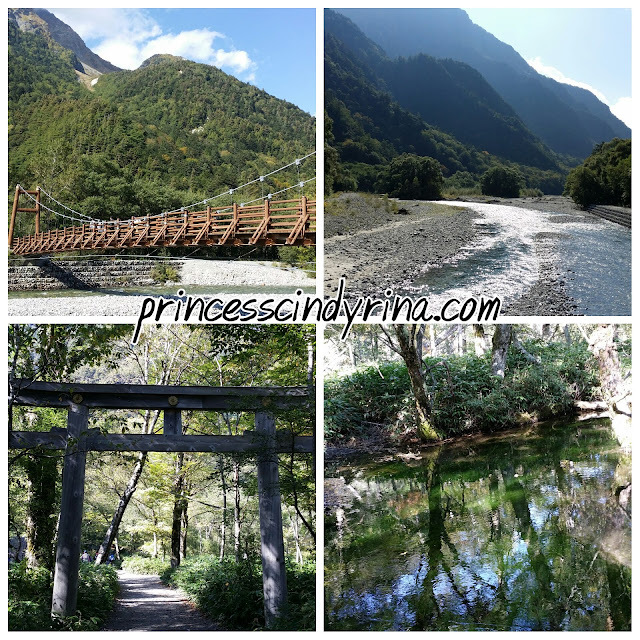 Kappabashi is a suspension bridge over Azusa River in the center of Kamikochi, not far from the bus terminal. Several hotels, restaurants and souvenir shops can be found around the bridge. 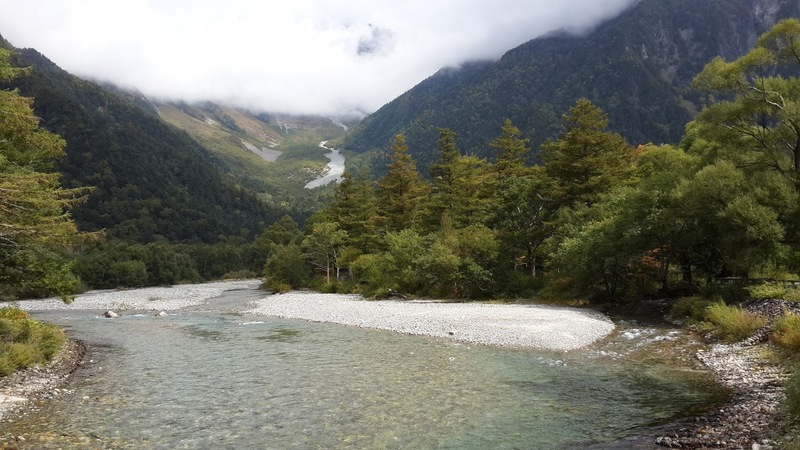 The Takezawa Marsh, reached in a 5-10 minute walk from the Kappabashi along the hiking trail towards Myojin Pond, is one of the most scenic areas of Kamikochi. Myojin Pond (Myojinike, admission: 300 Yen) can be reached in about a one hour walk from the Kappabashi. Hotaka Shrine and the Kamonjigoya , an atmospheric small lodge with restaurant, stand close to the pond. I didn't go in because need to pay. WTH! I was awful tired by the time I reached this area. I saw many Japanese uncle and auntie hiking to the surrounding peak and this activities only recommended between mid June and mid September. I was there end of September 2015. Stop by one of the pond to have bread and vitamin water picnic while enjoy the view. I remember keep saying this to myself.... Oh God! Thank you Thank you Thank you...for allowing me to enjoy this moment and be able to witness your beautiful creation. My most expensive travel. No regret! Looking at all the nature running wild like this...make one mind feel peaceful. Being able to enjoy the fresh clean oxygen without any haze....is a bless from my creator! I wish can shot better photo but with my skill...WTH! Most important I saw it live with my own eyes. Don't even scared to be alone here in the middle of nowhere. At least the bridge assure I was at the right track. This is the only place I greeted more than 50 hikers. If I said 100 you will think I was exaggerated but serious its their norm to greet each other 'Konnichiwa' means 'Hello' when we meet each other. For those with big backpack and look tired the others will boost up spirit by saying 'Gambateh' means 'Keep it up'! All of us totally stranger! and we were like Konnichiwa! Konnichiwa! Konnichiwa! Konnichiwa! again and again. This is the nature trails which keep all human unite. I will never forget this moment. The fresh air I breathe and the nature beauty I witnessed. I thanks to you God and all this because of your Will to me. My samsung health monitor said I had walked for 23km and seriously my knee was trembling due overworked. Mistakes I made here was...I jogged out instead of walking. WTH! I thought I am that young and strong woman. Its my dream to jog in the jungle like this. I saw one hunky Japanese man jog out...so I followed. WTH! After 15 minutes, I wish the bus terminal can be in front of me right away...WTH! it still one hour walk more. Ommaaaaa!!!! I book my boarding bus at 4:35pm. I made it down around 4:10pm and still have time to walk around snacks place which was closing. Attracted to that apple cakes but too expensive to buy. I think its a waste if I buy since I will buy it because its pretty and I don't really like to eat cakes anyway. 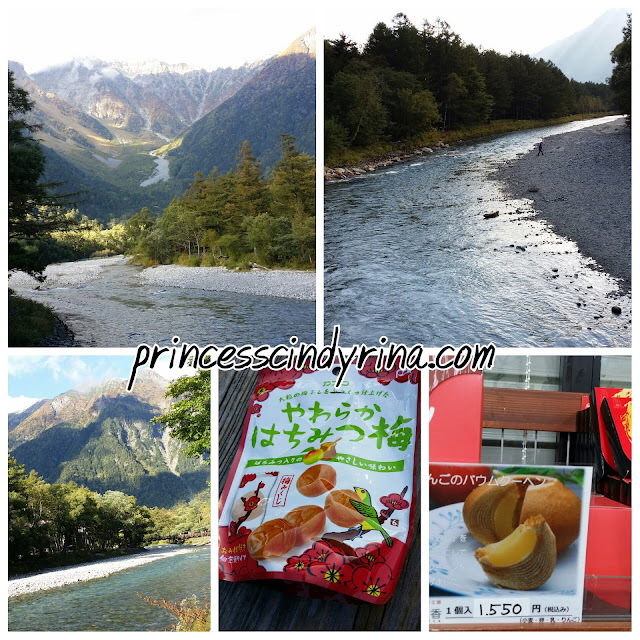 This area famous with fuji apples. I saw many apples farms during my train rides here. If you see that plum in the picture, seriously super salty pickles I ever ate. But when you are tired and hungry.... anything so delicious. See all those local uncles...so high spirit hikers. Some of them are professional photographers. By the time I reached Matsumoto station it was dark and I can see full moon. 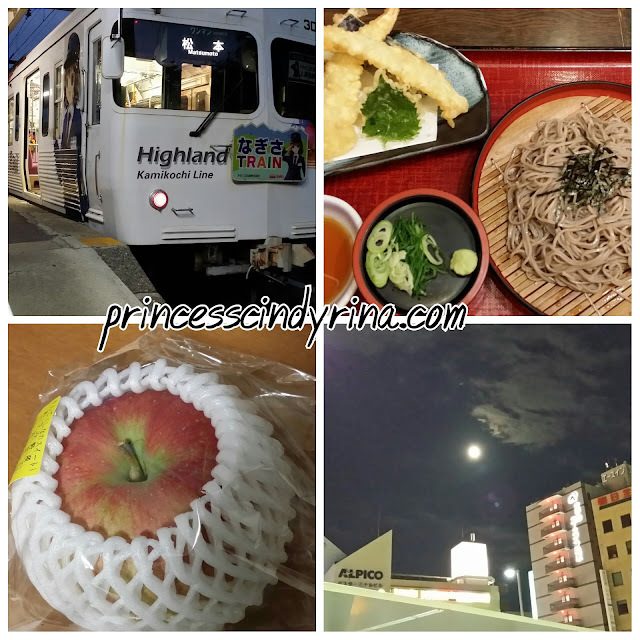 Bought some apples from nearby mart and have famous soba noodles with ebi tempura before back to hotel. 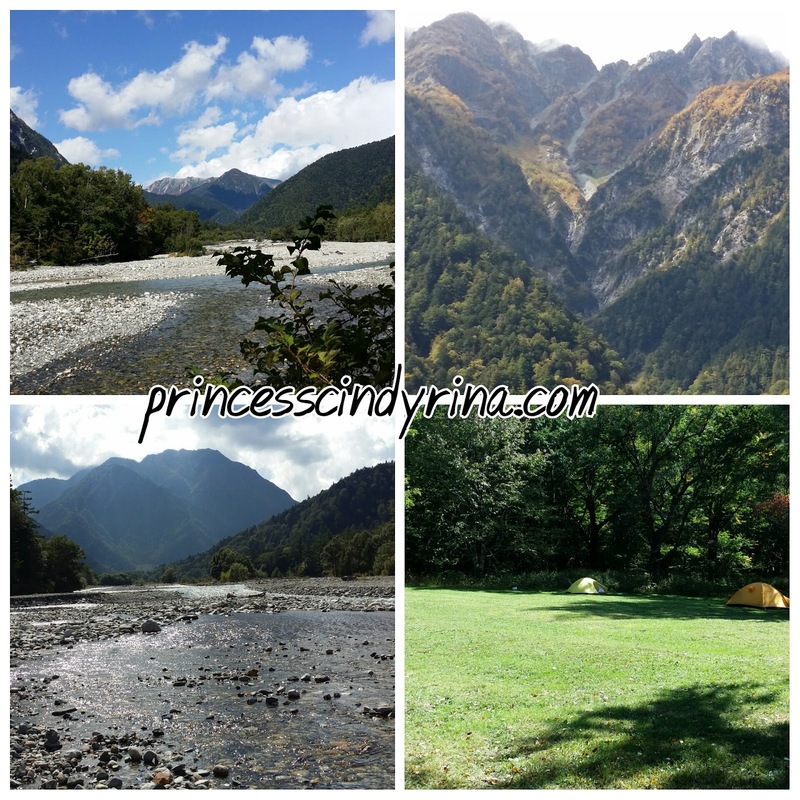 Tomorrow need to wake up very early again check out for alpine routes journey. God Bless my knee for tomorrow will be another long walk. It was super tiring but it was WORTH my efforts! I always travel with my mind set...this is my first and last time. If I can visit here again then its my fate and blessing from above. Make sure visit me again on Wednesday for beautiful alpine routes view. You won't regret! What?! You walked for 23km! @@ It's tiring but I believe is a wonderful and memorable trip. Lotta beautiful views! How I wish I can travel there someday. You so active. Salute you. nice view!!! 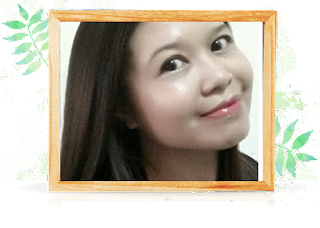 I like your photo!! The natural environment was so beautiful. I really need a vacation to Japan already. Wow~~~ I really salute you for the 23km!!! Waaa..stunning scenery! Totally worth the journey. I love your persistence! 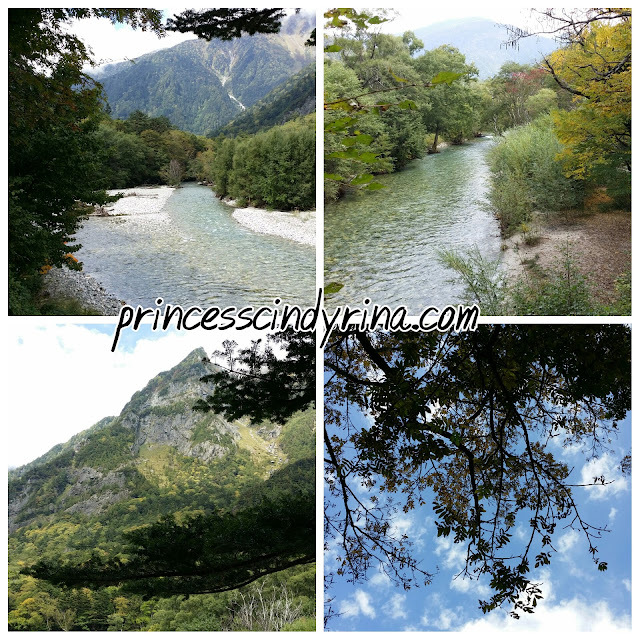 Kamikochi was so nature . really look great ! i think sure very nice during fall. What an adventure you had! The place looks quite deserted. i wouldn't dare go alone. OMG the place! Those natural scenes! I would love to visit this place. It sure a place that could calm your heart down! Japan has always been one the most beautiful place that i have on my travel list. Wish I can drop by there soon. Looks like its worth to track in Japan. The scenery is just breathtaking! Man this is soo beautiful!! I really wish to visit Japan soon! amazing view ! agree with what u said : the nature trails which keep all human unite ! I always love Japan. The scenery, clean environment, healthy food and well mannered people. omg 23km of walking distance? Its been a while since I have walk that long XD feeling old already! 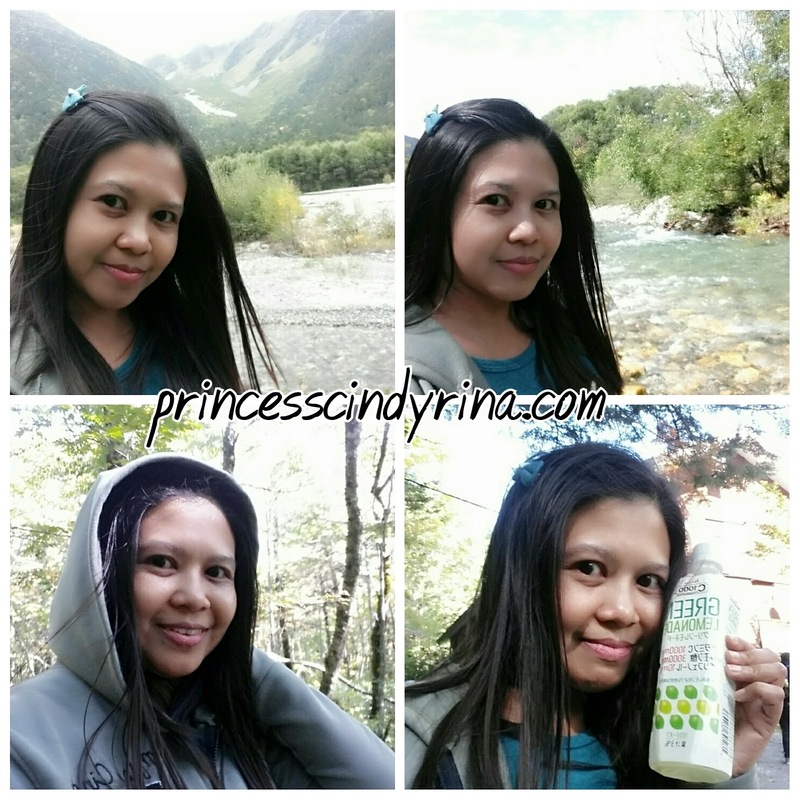 But it was really a good experience to be able to enjoy the mother nature and breath the fresh air out there! You are so sporty! 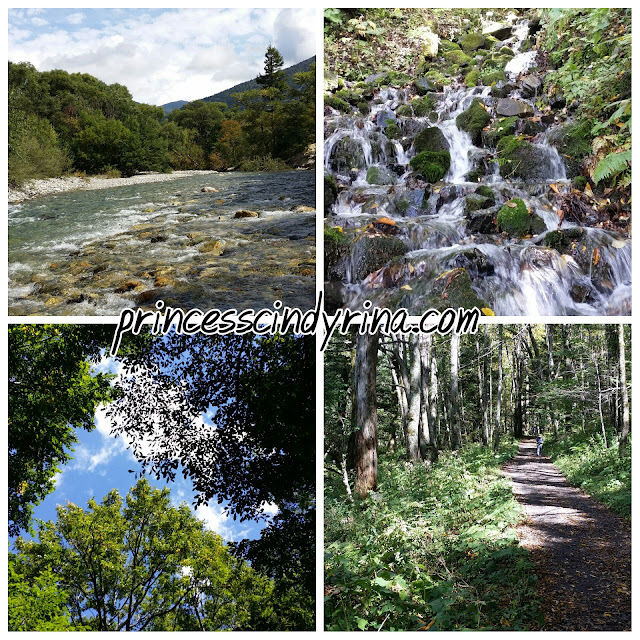 Go jungle trekking at Japan! beautiful scenery, trekking through these nice places really is the best ya. love that selfie of yours. the scenery is so amazing, if i were you i don't want to come back to Msia already. Wow. Salute you. 23km is a serious thing. I don't think I can do that without going flat on my face. Woah, it's super gorgeous! You're so adventurous and healthy (laughs). 23km will take my life away from me. Love the scenery! Love Japan! I am so envious right now!